HTC has finally lifted the curtain on the new HTC One M8 at a launch event this afternoon. 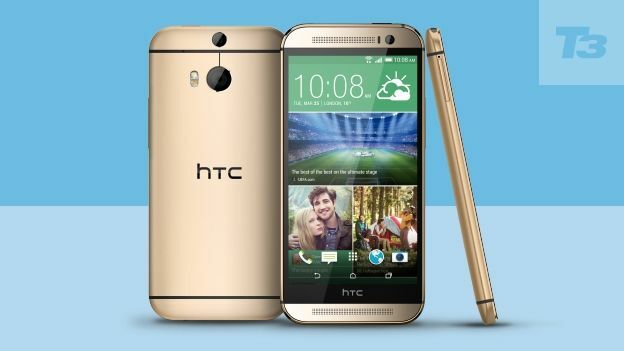 Set to take on the Xperia Z2, Samsung Galaxy S5 and of course the upcoming iPhone 6 the new HTC One M8 has launched with a range of new features to make it stand apart from the crowd. The smartphone manufacturer has also announed the HTC One M8 price with the new handset costing £529.95 SIM free. It'll also be available to buy today so check out our round-up of the best HTC One M8 pricing and network availability. The new handset boasts not only a new design but also comes sporting a new Duo Camera with two lenses as well as a new 5-inch Full-HD display. We were big fans of the HTC One here at T3 Towers, so much so that we named it Phone of the Year and Gadget of the Year at the 2013 T3 Awards. But can the follow-up possibly be as good? HTC has upped the ante on its new flagship considerably, with a sturdier metal body, bigger screen and a fancy hairline texture on the 'metal grey' version that feels great and oozes quality. The latest HTC Sense 6.0 UI and Android KitKat are here, along with an improved camera with depth sensor (more on that below). We know the new HTC One (M8) is all but certain to be shown off on March 25th, and a premature press release from Carphone Warehouse seems to have confirmed it. "Westfield Stratford, Westfield White City, Oxford Circus, Centrepoint and Tottenham Court Road stores will all be hosting special events celebrating the HTC launch with entertainment and giveaways as well as the first chance for customers to get their hands on the new device," said the press release. The Sense 6.0 UI appears to be all but certain this time around. According to evleaks the company is planning to launch a brand-new version of Sense, HTC's skinned UI. With HTC confirming that it would be bringing Android 4.4 KitKat to its current range of HTC One smartphones it seems logical to assume that HTC Sense 6.0 will in fact be running on the next version of Android. There's no word on how the UI would look but unless HTC is planning a huge design overhaul expect a more advanced and easier to use version of the current Sense which means improved BlinkFeed along with integration of Android's new features. This would mean you'll get the same improved Caller ID functionality which uses the Google Maps Business listings to find contact information if your phone doesn't recognise the number. According to @evleaks, the HTC M8 will feature a Qualcomm Snapdragon 800 processor with a 5-inch display and 2GB of RAM. It will – perhaps unsurprisingly – come with Android 4.4 KitKat, Sense 6.0 and 802.11a/b/g/n/ac connectivity. Its rear camera is said to be an UltraPixel, while the front camera will be 2.1 megapixels. This isn't the first time we've heard these specs. However, considering evleaks's track record, we'd expect the final specs to be the same or very close considering their “preliminary” statement. Photos have leaked via Unwired View which appear to show the new HTC M8 Blue Edition, whilst the most notable aspect of the images is that the M8 features a wraparound metal body what some may also have noticed is the extra circular hole above the camera. Some have postured that this could be space for a second camera, perhaps implying that it'll be able to take 3D images. Others have suggested that it's far more likely the extra hole will be a much-improved fingerprint scanner, in this instance designed for the first finger rather than the middle finger. The latest image to have leaked seems to confirm that the HTC One 2 will sport a fingerprint scanner. The image courtesty of Alibaba.com shows a case with space for both a camera and what would appear to be a fingerprint scanner. Whilst Apple nailed the technology with its Touch ID sensor on the iPhone 5s we were far less impressed with HTC's implementation of the tech in the HTC One max. Hopefully HTC will have learnt some lessons this time around, the HTC One max offered a lot of features with its fingerprint scanner that the iPhone didn't, instead they need to perfect the hardware itself and then integrate it into the smartphone better in a way that feels far more natural.